Falling demand for ancient craft may lead to a dying of the light, reports Zhou Wenting in Fujian. Li Zhuqin and her daughters have been burning the midnight oil making lanterns over the past two months. Days and weeks were consumed by the task and holidays sacrificed but they did it without complaint as this is the peak time to display their craft. 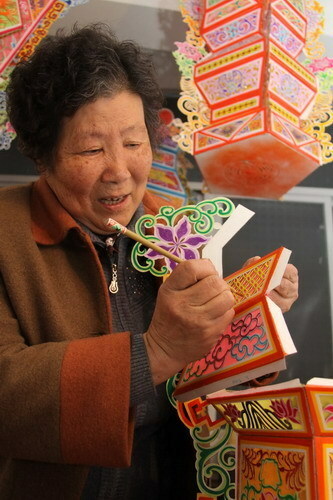 "We make around 50 lanterns annually" for the Lantern Festival, said Li, 69, but she readily admits that the income they generate over this period is not enough to support them for the year. Li lives in Quanzhou, Fujian province, and has been designated a national-level representative inheritor of the Quanzhou-style lantern. Li was awarded the title in 2007, four years after China launched a program to protect its intangible cultural heritage. As a result of this program, nine types of lanterns were chosen for heritage protection. Ten masters were then selected to pass on the skills and knowledge required to make these intricate lanterns. However, in an age of computer-generated ornaments and mass-produced lamps, the shrinking demand for lanterns threatens the cottage industry. The local government in Quanzhou holds lantern fairs and exhibitions and the central government gives each national-level inheritor an 8,000-yuan ($1,200) annual subsidy. But the lantern masters still find it hard to "prop up starving family workshops", as Li puts it. Heritage experts say more is needed to preserve and pass on the ancient craft. They want to see greater assistance given across the board to lantern makers, and more commercial opportunities explored. Lanterns represent not only manual skills, but also folk customs, especially in cities such as Quanzhou, which has a long-standing and unique history of lanterns. As the starting point of the maritime silk route, Quanzhou imported palace lanterns and dragon lanterns in the Tang Dynasty (AD 618-907). In the Song Dynasty (AD 960-1279), 3,000 imperial family members settled there and brought with them the custom of hanging exquisite lanterns in front of every house. Later, the prosperity of trade brought more lantern styles to the city, and innovation by local folks geared up the rapid development of the Quanzhou-style lantern and the city's custom of celebrating the Lantern Festival with a lantern fair. 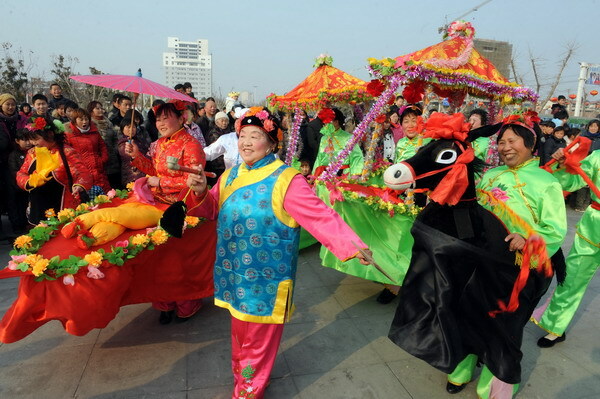 "The lantern night is a carnival for Quanzhou, with millions of people taking to the streets to light lanterns," said Sun Xiujin, 54, an employee of Quanzhou Intangible Cultural Heritage Protection Center. To support the tradition, Quanzhou city government began to hold an annual lantern fair in 1978. And in the good old days, both the masters and their skills enjoyed a big boom. Li's father, paper-cut master Li Yaobao, established Quanzhou Arts and Crafts Factory in 1953, and it cultivated almost all of the famous masters in the city. Also in the 1950s, he resurrected the glass fiber lanterns that were unique to Quanzhou and applied his skill, making paper-cut glass fiber lanterns without the framework. Li Yaobao designed the finespun graphic patterns, and carved them out of cardboard. Glass fibers were placed in rows on the reverse side, refracting the light from the bulb inside. No iron wires prop up these lanterns; instead, layers of shapes are glued together. The lanterns were hung in the Great Hall of the People in Beijing on the 10th anniversary of the founding of New China in 1959, and they became national gifts for foreign guests. Li Zhuqin inherited her father's talent. When she cuts graphics on 30 pieces of paper in a stack, the first and the last are exactly the same, and the smooth curves are as fine as hair. 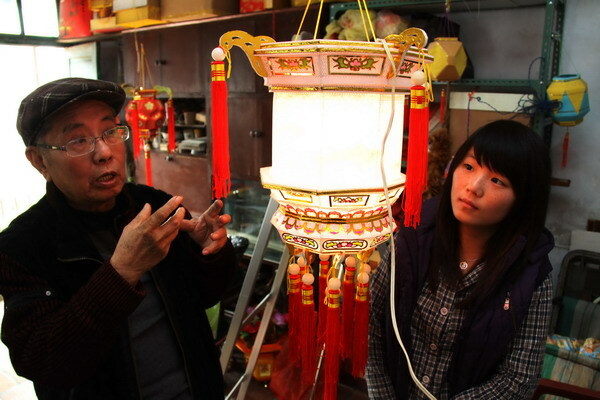 Even so, the craft of lantern making doesn't provide for a decent life anymore, Li said. The factory exists in name only now, and the masters are out of work. Some pedal passenger tricycles to make a living, she said, "and some can't even afford the medical insurance". Li's daughters - Li Chanjuan, who is 44 and a city-level Quanzhou-style lantern inheritor, and Huang Lifeng, 43 and a provincial-level inheritor - were laid off from the arts and crafts factory a decade ago, and are concerned about the sales channel for their family workshop. Although the city's cultural bureau provides them opportunities to participate in exhibitions, they said, they gave up most of them because they couldn't afford the expense. Last year, Huang went to Xiamen to take part in the cultural industry fair between the Chinese mainland and Taiwan. She received a subsidy of 100 yuan a day, but received no orders for lanterns. "We don't get any benefit from the title, which brings only reporters' interviews and officials' visits, but no orders," said Cai Binghan, 82, the other State-level representative inheritor of the Quanzhou-style lantern, and the only master of the needle puncture lantern. The protection of inheritors should be prioritized in the rescue of cultural heritage because the skills lie in people's hands, some experts say. "The market has changed People no longer hang lanterns in high-rises as they did in one-story houses in the past," said Huang Jian, deputy dean of Quanzhou Normal University's art and design college. "So the government is responsible for motivating the industry, as it is hard for individuals to enter the mainstream culture with folk craft."